For the sustainable development of an entity, the strategy and the value creation cannot be analyzed in purely financial terms. Corporations must apply the principle of balanced development through disclosing economic, environmental and social combined aspects. Sustainability reports are sometimes known as Triple Bottom Line (TBL) reports or Triple P (people, planet and profit). A well-known example is the concept of multidimensional performance evaluation focused on the TBL theory. This chapter per the authors presents the fundamental concepts used in TBL reporting practice, ensuring a uniform terminology, and identifies and promotes the best reporting practices used in social and environmental decision making. As conclusion, it was reiterated that the future of TBL reporting is the achievement and the acceptance of a conceptual framework and of normative-pragmatic standards to support a comprehensive and credible reporting of the three dimensions. Sustainable development policy and practice have attracted considerable attention and debate in the past 20 years. The understanding of and concerns about environmental and sustainable development issues have exponentially evolved over time. Evidence suggests that a focus on reporting economic, social and environmental information results in advantages for financing, insurance, marketing, regulatory treatment, and other areas. In the rapid evolution to a global marketplace, having a set of common rules is critical to facilitating trade. The challenges created by global competition make it imperative for entities to continually rationalize and improve all their resources and processes. This research initiative is based on the evaluation of models for sustainability through an interdisciplinary approach that recognizes the necessity of a new accounting model leading toward advanced forms of decision and responsibility as a communication bridge between the entity and its stakeholders (customers, suppliers, governmental agencies, employees’ families and special interests groups). 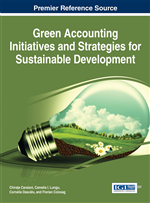 The most comprehensive view on corporate reporting is based on the sustainable development concept. Sustainability reports based on Triple Bottom Line theory involve evaluating entity’s performance through disclosing economic, environmental and social combined aspects. The response to the current needs of society is the multidimensional approach of the simultaneous development of the three joint features. It is obvious that professional bodies should carry out the most important task for the future as it is happening today with the financial reporting. Sustainability reporting has the potential to provide critical information for business analysis that is normally absent from financial reports. This information complements financial reports with forward-looking overview that can enhance the report users’ understanding of such key value drivers as human capital formation, corporate governance, management of environmental risks and liabilities and the capacity to innovate. In some circumstances, sustainability performance information already can provide insights to support business analysis and may have relevance within the framework of traditional financial reports. Fully articulating the relationship between financial and sustainability performance will require more time and research to link the performance indicators used for these areas. By consistently measuring sustainability performance over time, companies can strengthen both their internal business practices and their external communication. At a more general level, the economic environmental and social trends may occur in those sections of financial reports relating to the discussion and analyze of the future risks and opportunities. Several financial reporting regulations worldwide require companies to disclose known future uncertainties and trends that may materially affect financial performance. In the case of certain industry sectors or companies, discussion of sustainability performance would be merited where environmental or social concerns may affect a company’s ability to expand operations or where mishandling these issues could lead to significant damage to corporate reputation and brand value. The new codes of corporate governance have increasingly begun to highlight the need for discussion the risks associated with sustainability concerns at a board-level (Caraiani, Dascălu, Lungu, & Gușe, 2007). The ideas presented above question the extent to which the goals of sustainability can be met through corporate strategy and governance. The presentation of social and environmental information, along with the economic one is extended through the measurement process and it is disclosed through management approach to risks and strategy linked to measurement principles, related to all areas of the Triple Bottom Line concept. The economic, social and environmental goals of an entity may be independent goals, but they should be combined in a model that integrates external factors (environmental concerns, environmental exposure and other facts) and internal eco-control (management control systems of environmental performance) to lead to the global performance of the company (Henri & Journeault, 2010).